Thalictrum – Dig Delve – An online magazine about gardens, landscape, growing & making. 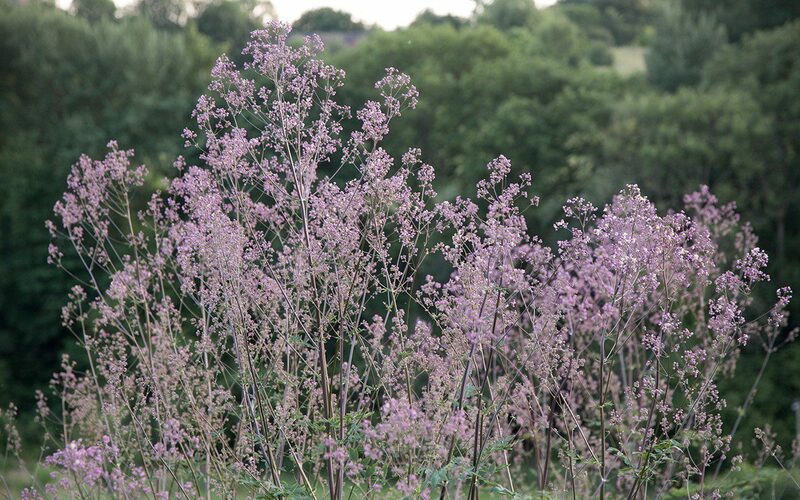 The Thalictrum ‘Elin’ are as spectacular as they ever will be, topped out at what must be almost ten feet in height and clouding a myriad of tiny flower. They are in their second year now and have been good from the day they broke their winter dormancy. Last year they sent up just a couple of spires each but, with roots deep and a year behind them, they have powered a forest of lustrous growth. First, an early mound of feathery foliage of a glaucous, thunderous grey flushed with purple and bronze which, by the end of April, had reached its full expansion and was ready to charge the ascent of muscular vertical stems soaring towards the solstice. Slowing once they had reached their full height, the panicles broadened as the lateral limbs filled out with a million buds. The ascent was every bit as remarkable as the cloud of smoky violet flower. Arguably more so for the dramatic build and anticipation. ‘Elin’ march through the planting in the lower part of the garden to provide punctuation, and I am depending upon them now to stay standing. Last year, when their limbs were heavy with flower, a rain-laden wind toppled them like ninepins, so I staked them with a waist-height hoops in early May to prevent a repeat performance. In our deep, hearty soil with plenty of sunshine and no early competition around their crowns, there has been nothing to hold them back, so I have grown them hard and so far denied them extra water. I am hoping this will mean that they grow more strongly and that their companion sanguisorbas help them to stay true. 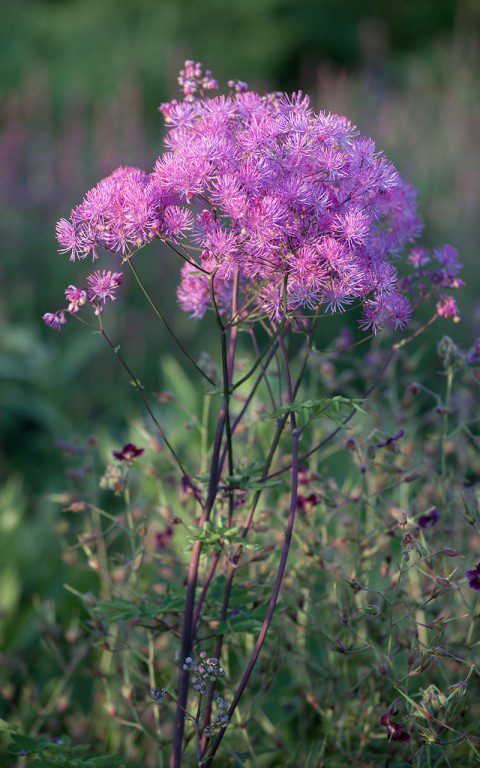 I have grown Thalictrum aquilegifolium for years, where it is reliable in both sun or shade. A basal clump of foliage – well named for its similarity to columbine – is an early presence in the spring garden and the flowers are sent up early, ahead of most other perennials, so that there is a clear storey between them and their foliage. The wiry stems support clusters of stamen-heavy flowers which, when they are out, resemble exotic plumage. In the true species, the flowers are an easy mauve, but ‘Black Stockings’ (main image with Salvia nemorosa ‘Amethyst’ and Iris sibirica ‘Papillon’) punches the colour up, with dark-stained stems and buds the colour of unripe grapes that open into flowers that register strong violet-pink. I have the white form too, which is strangely rare in cultivation, but not impossible to get. My plants came from the Beth Chatto Nursery, but I will be saving seed, which is viable if sown fresh, and I’m hoping will come true as they are quite some distance in the garden from their cousins. Seedlings that aren’t true white will easily be spotted for they have the purple stain, when the white form is pale, apple green. I plan to have plenty to play with and want to see if they will take in some open ground under the crack willow, where I let the Galium odoratum loose after it misbehaved and took too well to the garden. 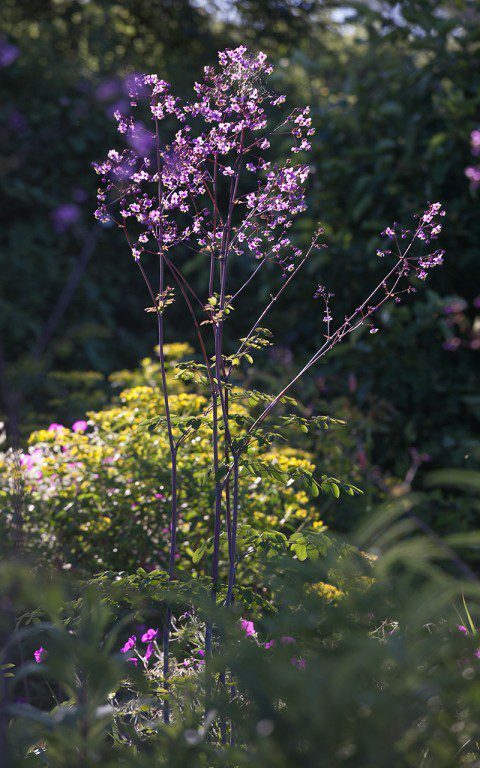 Until ‘Elin’ appeared on the scene relatively recently, Thalictrum rochebruneanum was the tallest and most dramatic of the tribe. 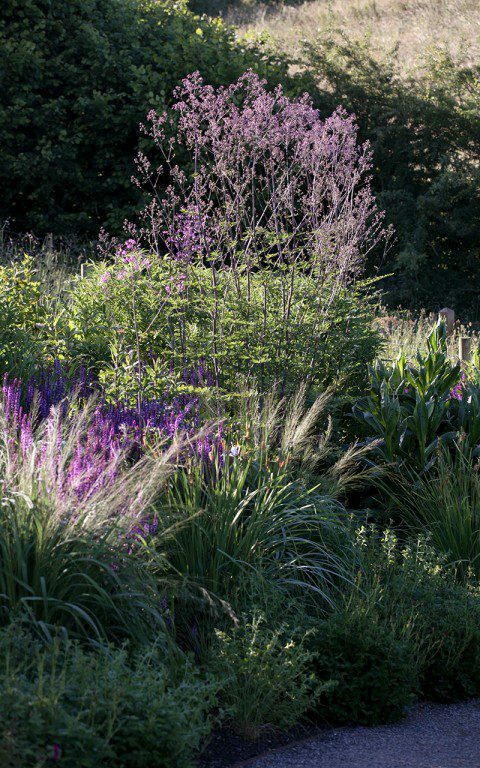 I saw it first at Sissinghurst, where it towered with Cynara in the purple border. As a teenager I lusted after its rangy limbs, impossibly fine it seemed, and the suspense in the delicate flowers. It languished on our thin acidic ground in my parents’ garden, growing to half the height. I tried it again in the Peckham garden, but it hated the way our soil dried as the water table dropped in summer. However, I have grown it well in California where, with a little extra water and shade from the sun, it seeds freely to spring up spontaneously as ‘volunteer’ seedlings. I hope that it will do the same for me here. So far in year two, it has done well, certainly not as well as ‘Elin’ but, with three or four flowering stems per plant, which have enjoyed the light at the base where they have been planted amongst later-to-emerge persicaria. 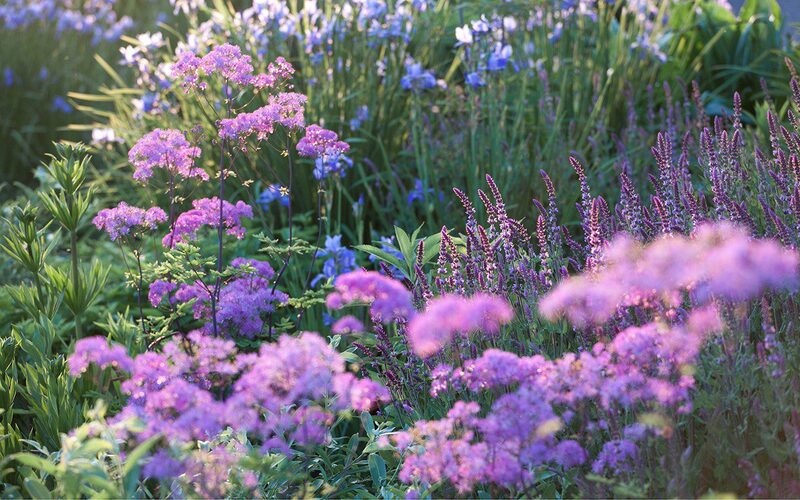 Hailing from Japan, where they find a niche amongst other perennials that like a cool, retentive soil, they must be a spectacular sight to come upon. 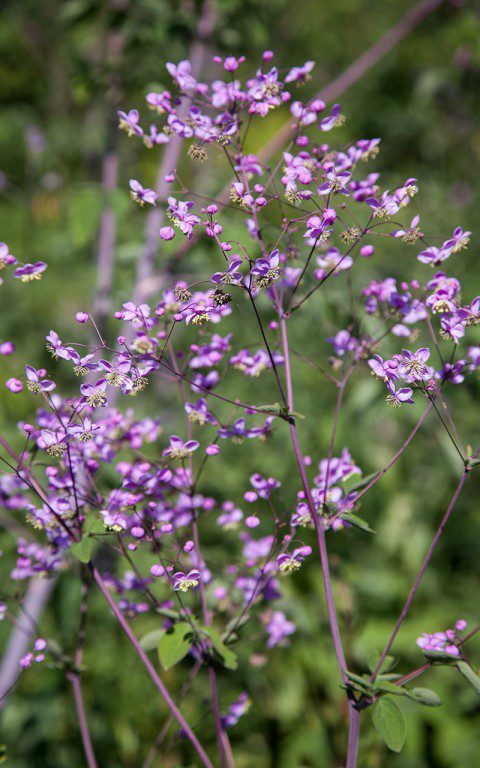 Where ‘Elin’ is all about quantity, the flowers forming a Milky Way when they come together, every flower of Thalictrum rochebruneanum is a jewel. Richly coloured like gemstones, held sparsely so that your eye is drawn to the individual, inviting you to spend some time to take in the space and the colour contrast of the inner parts of the flower. A cup of violet petals holds the gold provided by the pollen and projection of anther within. Never getting everything completely as I want it to be, I see now that I need to bring a plant or two up closer to the path, so that I can take in the detail and enjoy looking up, for you have to, your neck craned. Being early days in this garden, I can only hope for a volunteer or two to take to this ground and let me know that I have finally found them a place they really want to be.